^ Countries of the World: 21 Years of World Facts, geographic.org, http://www.theodora.com/wfb/abc_world_fact_book.html 2008年8月17日閲覧。 . ^ National Atlas, Average Annual Precipitation, 1961-1990, URL accessed 15 June 2006. ^ Hereford, Richard, et al., Precipitation History of the Mojave Desert Region, 1893-2001, U.S. Geological Survey, Fact Sheet 117-03, URL accessed 13 June 2006. ^ NOVA, Tornado Heaven, Hunt for the Supertwister, URL accessed 15 June 2006. ^ O'Connor, Jim E. and John E. Costa, Large Floods in the United States: Where Thley Happen and Why, U.S. Geological Survey Circular 1245, URL accessed 13 June 2006. 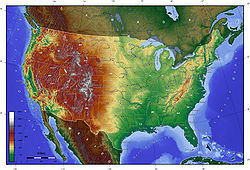 ^ Williams, Jack Each state's low temperature record, USA today, URL accessed 13 June, 2006.